Over the last two months we had Real Retail Sales, Industrial Production, Personal Incomes and Non-Farm payrolls all pushing new expansion highs. The only data not in for December now is Real Incomes. In addition we have noted upward revisions as opposed to the downward revisions promised by the recession-is-here camp. With neither leading nor co-incident data to lean on in support of a recession call, options are getting slim in defense of a recession that is supposedly in its 6th month. Expect heavy reliance on the Co-Lagging (Coincident to lagging) index in support of recession calls. As we stated several months ago when the bears first threatened with downward revisions (see Effects of revisions on co-incident Recession models), there appears to be no clear-cut reliance that can be placed on co-incident data revisions coming into a recession except to generate false alarms (i.e revise upwards) slightly more than they revise downward. 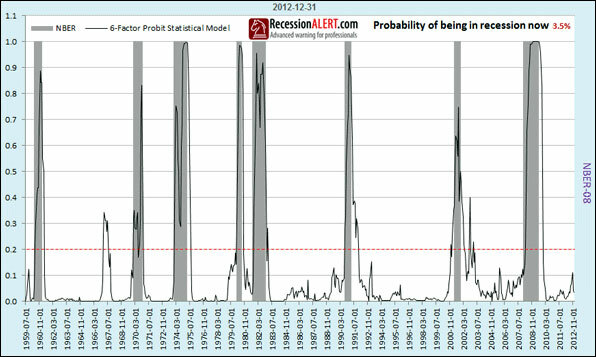 With the upwards revisions of the last few months coupled with the new highs been made by the big-four indicators for December 2012, we have co-incident recession probability from our NBER Model – confirmation of last resort falling to around 3.5% We would at the very least require to see a collapse of dramatic proportions in at least 3 of the 4 indicators in January in order for Dec 2012 to be tagged as the business cycle peak. In the meantime the US stock market keeps printing new highs.